I grew up in a small town in the middle part of America, the kind of town where the same families have lived generations, and everyone mostly looked like each other, which is to say, in my case, this was white. I point this out because for the most part my exposure until 18 or so to people who didn’t look like me came from television, and as a small child, specifically from Sesame Street. In May, Sesame Street turned 40 years old, which makes it older than me, and also certainly make me part of the first generation that grew up with Sesame Street. As someone who loves TV (obviously) it can certainly be easy for me to overstate the importance of a particular show in political or generational terms. And whilst I certainly do not want to say that, for example, Sesame Street is the only reason that Barack Obama was elected president, I think it is fair to say that Sesame Street played a part. So many of the people who elected him were 35 and under, or the Sesame Street generations. I was an ideal canvas for Sesame Street I suppose. I grew up in a home not hearing racially motivated slurs of any kind, from a class position that would (especially as a kid) have been no higher than middle-middle class, and was generally taught, both in places like school and church, and by example from my parents, that all people were equal. What I lacked was many if any real life examples of People of Color, or even people with a disability. Sesame Street worked fit what I was being taught, and visually showed to me from a young age that Americans are all sorts of people. I think there were many children like me who were just as influence by this message. Sesame Street was designed to give pre-K children a television learning experience, teaching us basic numbers and our Alphabet while also showing us life on the “Sesame Street.” I somehow always knew that Sesame Street was in New York, and that New York was very different than my small town. But it was okay to be from a small town or a big city or somewhere in between! I can, to this day, count to 10 in Spanish, and know that “Hola means Hello.” More importantly, because of Sesame Street, I knew that Gordon was Black, Linda was Deaf, Luis was Hispanic, Bob was White, Kermit was Green, and they all were friends with Big Bird, who is six. (I remember when I was six thinking how we were the same age!) Sesame Street has the most integrated cast in television, one that matches its message of acceptance. Sesame Street has always gotten the biggest stars from film and politics and music, from Tina Fey to Jesse Jackson to Stevie Wonder. Sesame Street isn’t “color blind”; it doesn’t try and say there are no differences between us, but rather it says, we are all different in some way, and that’s okay. I think the brilliance of Sesame Street is that is shows little kids what America should be like, before they realise that America is not like actually like that yet, and as they grow older these kids question why it is not like that. Sesame Street, and its progressive ideas on what America could be, have become part of our collective memories, and in turn, these attitudes have started to seep into our collective generational consciousness. We begin to believe that we can help make our country a bit more like Sesame Street. We are not where we need to be, but at least, we know we should be somewhere else. Of course, the other great part about Sesame Street is that it is just so darn good! I could post about 20 clips that I love and remember from Sesame Street. Instead, I will stick to five. 1) This video, Me and My Chair, is one of those that has stuck with me after all these years. I certainly don’t know why, but I never knew anyone who used a wheelchair when I was young so maybe that’s why. Please excuse the bad video, and the bad voice, as I sing along. 2) I had to include this clip, sung by the Pointer Sisters. It routinely shows up in Best of Sesame Street lists. I can’t argue because well, it is great. I warn you, it will get stuck in your head. 3) This is perhaps one of the saddest scenes ever in television. Big Bird can’t understand that Mr Hooper (or Looper as Big Bird calls him) has died, and that this means he isn’t coming back. I am old enough to remember when Mr Hooper was part of the cast and when he died. For some reason I have a memory of watching this at my Grandparents’ house. It is a very pragmatic and real way of teaching children about death, and I sob every time I watch it. (NOTE: Sadly this video was removed and I can’t find another one, so you’ll have to trust me. It makes me cry every time). 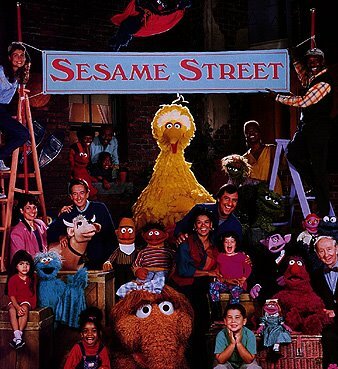 4) The music is one of the best parts of Sesame Street, and there are so many I could include. There are the Bee-tles, Tammy Swine-ette, various musical guests, and a great version of Sing (sing a song). But for me, this one, sung by Ernie (and in this version) Aaron Neville, is one of the sweetest expressions of friendship in the form a very melodic, if slightly melancholic tune. 5) One of my absolute favorites, that I remember watching and singing to. It has the line, “my name is you” that I admit that as a kid, I didn’t quite get what they meant but man, I totally wanted to play in that park with those kids. Who are all, like, 40 now. This is the perfect expression of “Sesame Street Values” and I for one think the choppy editing and crazy lip syncing add to its charm. I really could go on and on, but once again, this post is so very long, and I didn’t even talk about the Sesame Street records I used to listen to (like the one where Big Bird has to find the Orchestra). A great website to reminisce about Sesame Street is on Babble, where the author has posted 50 top Sesame Street moments, including the time when the adults finally see Snuffy. As one can see, when I love a television show, it is very easy for me to be idealistic and long winded! So, I’ll wind it up, with just one exaltation left to say: Happy Birthday Sesame Street, thanks for the memories, and keep up the good work.